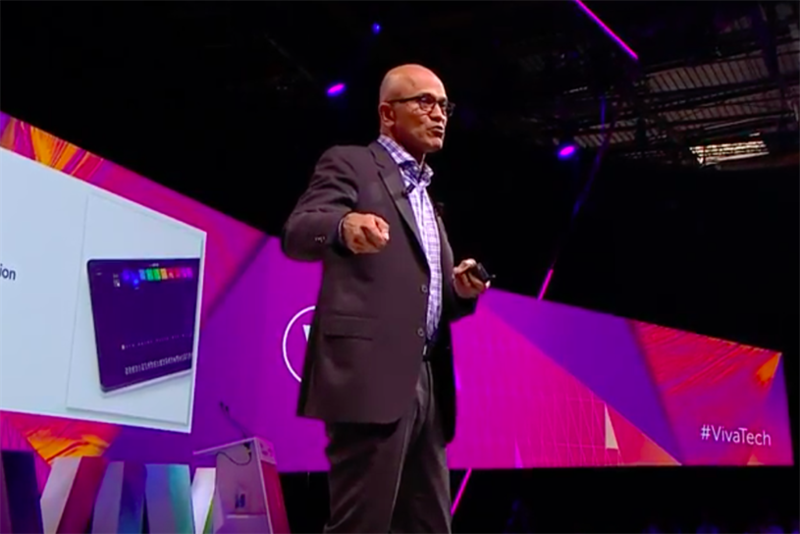 Microsoft's new sense of purpose is to democratise elite AI-technology, its chief executive Satya Nadella told VivaTech 2018. "We want to democratise it to the point that any entrepreneur, public or private organisation can succeed with their core mission using this technology," Nadella (pictured) said. Computational power has become so embedded into our lives, our economy and our countries that it has given tech industry tremendous power and thus, responsibility, he explained. Microsoft, he underlined, is keen to embrace its responsibility – implicitly setting Microsoft apart from newer tech companies such as Facebook, Uber and Google that have recently run afoul of regulations and consumers. "Just this week we announced that the core data rights at the core of GDPR are something we will take to every part of the world we operate in. Security, we led the coalition of 34 tech companies to essentially create what is today’s Geneva convention. Lastly, it’s the ethics, the principles that guide the development of the most defining tech of our times which is AI," Nadella said. The idea that some technology will come along and transcend human capability has been humanity for many years and now that AI has come, humanity has to make the right choices about it, he continued. Nadella then went on to underline several significant and recent technological breakthroughs including XiaoIce, its chatbot in China. "It is an AI-driven chatbot capable of having open-ended conversations. Conversations with humans. It is capable of starting a conversation in chat and continuing it on telephone - but it needs to acknowledge that it's an AI, not a human the person is interacting with," he said. "The future we invent is a choice we make. This opportunity and responsibility are what grounds us as a company in our mission to empower every person and organisation on the planet to achieve more," he said. "We want to create tech so everyone here can create more tech. Our success is dependent on your success. We will measure our success not by the surplus we create for ourselves but in the surplus we create for the countries."